Our main partner is Caminhos Language Centre, the largest and most exciting language school in Brazil. Like Eco Caminhos, the school operates as a “social business” for its students, for the children of the nearby community and for its staff: An organisation that does not try to exploit anyone, but, instead, is looking to offer high quality to all stakeholders. The Caminhos Language centre is situated in Ipanema, Rio de Janeiro, where it offers high quality Portuguese courses. What makes the school special are its free daily activities and the fact that the school has its own on-site social programme for children of Rio de Janeiro. So part of the fee you pay for your Portuguese lessons goes directly to the children of Rio de Janeiro. The school has a well-established homestay programme i n Rio de Janeiro, which allows students to stay with local Brazilian families. The students are submerged in Brazilian culture and get a chance to practise their Portuguese in real life. The school offers students a complete Rio de Janeiro experience without overcharging. The Portuguese group courses in Brazil start at 23 Reals (+/- 6 euros) per hour; the best price in town. The school can offer these sharp prices because it has grown to become the largest school in Rio and even in Brazil. The best way to double check all these positive words about the school is by visiting their TripAdvisor page where the school is ranked number one in Rio de Janeiro. 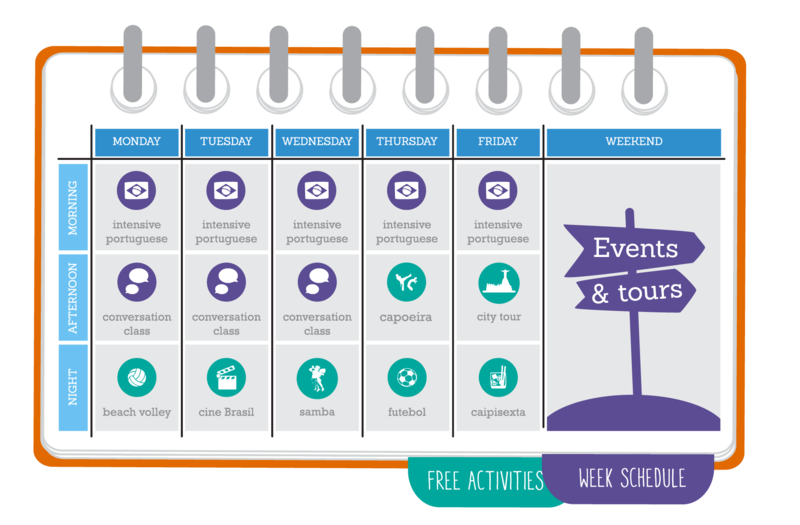 From Monday to Friday your schedule can be fully booked with fun stuff to do in Rio de Janeiro. Over the years the school has tested a large number of activities and have only kept those that are really popular among the students. If you would like to join Eco Caminhos, but wish to start off by learning Portuguese in Brazil with the Caminhos Language Centre, we can organize special custom.